LITHUANIA. 1922. 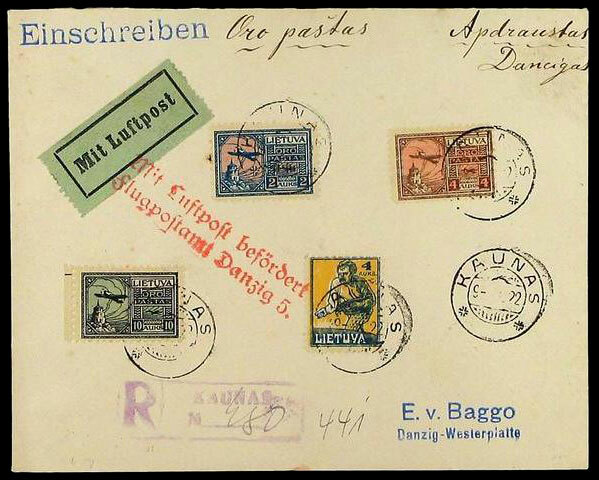 Registered airmail cover to DANZIG franked by set of three 1922 Airmails and 1922 4 a. Sower all tied KAUNAS cds´s with two line cachet MIT LUFTPOST BEFORDERT/FLUGPOSTAMT DANZIG 5 in red, and arrival cds on reverse. SG 121-123, 124.